As I write this blog I complete my second annual Think Week. I thought I’d share some of the experience, how it came about for me, and how I use it. For a dozen years now I’ve taken some intentional outings to be alone, to reflect deeply and to explore matters beyond the everydayness of life. Each outing provided its own journey. In 2005, I lived a month in a Zen Monastery; in 2007, and 2008, I spent 3 weeks each year writing in Cape Cod, and in 2012, I ventured to Sedona for 3 months to regenerate and explore direction. With these intentional pauses, I explored different dimensions of myself, pondering the question: What matters most? And What is my work? 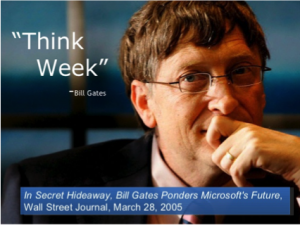 In 2015, a colleague gave me an article on Bill Gates and his annual ritual, Think Week. For years, Gates has gone into seclusion for two “Think Weeks” a year. Family, friends and Microsoft employees were banned from his retreat and since this has become public, others have adopted this practice. 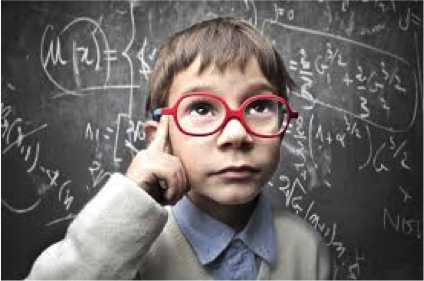 First let me premise this by stating that genuine Thinking involves weighing evidence that questions, not confirms, our thoughts, assumptions, and beliefs. That questioning includes discarding outmoded views and then becoming open, available, and awake to different views. When I discuss a Think Week with others or read remarks about it, I see all kinds of observations. So let me offer some clarity. Take the two words THINK and WEEK, literally and seriously. To be precise, the intention here is to get away long enough to allow for creative thinking that is not possible in the din of everyday life. Spa Day: A spa day involves a spa for a day and can be great to unwind and relax, so go for it. At the end of the day, we return to our routines. Vacation: We take vacations to unwind, visit family and/or other locales. Vacations can be fun to plan and allow for surprises, to explore new experiences, connect in new ways, and to reminisce. Retreat: We attend retreats as a refuge, to learn, commune, or contemplate within a specific community, study regime, or set of goals. Escape: Boy can these be great. Living in New York City, I find myself close to many escapes or weekend jaunts to get away and unwind. These quick getaways and diversions offer a different kind of stimulation. A Think Week pulls us from our ordinary routines and for many, including me, that often takes 24-48 hours just to settle, let go, and begin anew. If I haven’t lost you yet, a Think Week may be just for you. So then, why consider it at all? After engaging two Think Weeks back to back, mine has become a constructive break from the normal routine. I disconnect and explore items from a quiet space, and larger view, to access my creative thinking, and to reflect, reset, and clearly rethink goals and direction. It is important to structure your Think Week. Bill Gates is highly organized and has enrolled colleagues and friends to send him items – reports, magazine articles, and books – to review for his two yearly Think Weeks. He spends 15 hours a day plowing through the material and connecting dots in ways not possible in his everyday life. 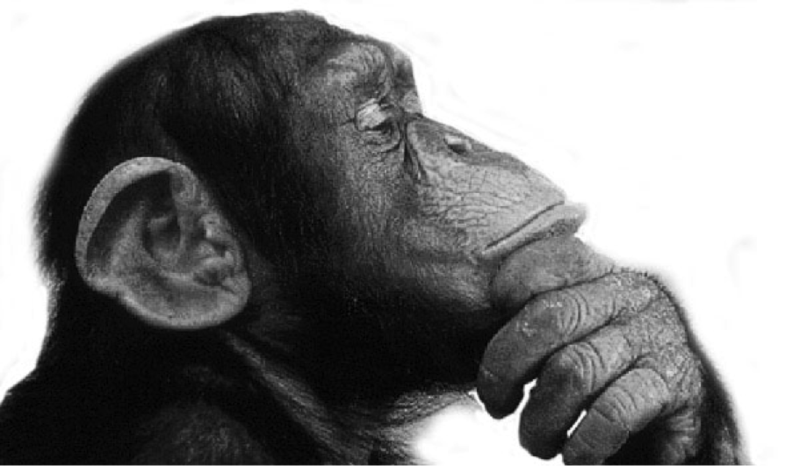 I find my Think Week works well by setting an intention. Last year I took my week before launching this blog. I explored its direction, audience, and approach. I played with many blogs, researched models, and considered many topics. With that, I ended up writing drafts of seven blogs – but more important, I sank into a blogging zone that I can now tap during my ordinary routine. This year, having ventured halfway into a two-year Buddhist immersion program on contemplative psychotherapy, I decided to use my Think Week to draft a Contemplative Pedagogy for the program. More importantly, when completed it will become a manifesto for the next leg of work at our firm. For me, a balanced Think Week involves creating a clear intention and allows for enough time each day for the unexpected to arise. It’s time to let go of to-do lists, measured results, and goals that are too specific. The thinking you can access will offer something unexpected. Be intentional, and be surprised. First, find a place that moves you. I selected a small town, two hours north of New York City on the Hudson River by way of Amtrak. It has a consciousness that’s a match for me: it’s a walking town on the river, has used bookstores, coffee shops, meditation and yoga centers and some fine dining. I am not vacationing but I take daily walks to unwind, and spend a segment of mid-day time writing in a coffee shop, so these items are important. Second, handle incidentals in advance. The point of a Think Week is to attain a different level of thinking, so it’s important to handle as many incidentals in advance as possible. If possible, arrange for groceries to be delivered, or handle it all on the first day. Plan meals for minimum preparation and ease. Get plenty of “no-screen” time, away from gadgets. Bring notepads to capture thoughts when away from screens. Third, develop a routine that engages you. Stretch beyond ordinary routines to discover what engages you. I structure my days into fourths: 1) morning block, 2) mid-day block, 3) evening block, 4) nighttime block. I leave my rental during the mid-day block to allow my mind to wander a bit. It’s good to eat at the same time every day, and to find time daily for breathing, even if in 10-minute breaks. Having these weeks scheduled in advance allows me to steer items into buckets for deeper reflection and exploration. Knowing that I have these weeks, invites colleagues and clients into unexpected dialogues, and deeper relationships. 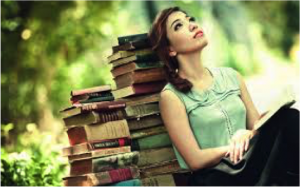 Given the nature of change and information, today, these Weeks offer sacred quiet time, and clear space, with no “productive” agenda — a time to train thinking muscles, care for the mind and cultivate my being, as relied on by many throughout the year. In a relaxed environment, these weeks remind me about what matters most. Think about it for yourself.